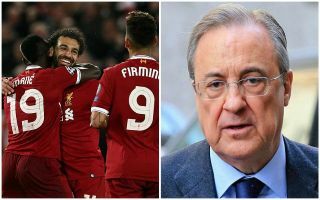 Real Madrid president Florentino Perez is reportedly ready to take a look at how three key Liverpool figures do in tonight’s Champions League final. The Reds meet Los Blancos in Kiev for the biggest game of the club season, with both teams desperate to get their hands on the European Cup. Still, Perez already has the summer transfer window on his mind as he looks into raiding Liverpool for two of their players and possibly their manager too, according to Don Balon. Mohamed Salah has long been linked with Real and remains on Perez’s wish-list, while the report also states Roberto Firmino could be targeted to replace Karim Benzema. Don Balon also mentions the possibility of manager Jurgen Klopp being in contention to replace Zinedine Zidane, who may face question-marks over his future if Madrid are beaten tonight. The Spanish giants have won the competition for the last two years in a row, and three times out of the last four, and will be heavy favourites this evening. Still, Liverpool have shown plenty of bottle in the Champions League this term and have the players to cause their opponents big problems. No wonder then that Don Balon report Perez is so keen on their manager and two of their best players. Could Jurgen Klopp replace Zinedine Zidane at Real Madrid?